It’s a fascinating collection that includes ‘heavy’ and light operas, symphonies, concertos, waltzs, organ music, hymns, religious songs, war marching songs, popular songs, versions of Handel’s Messiah in abundance, the Manx national anthem, lectures on music, ‘Old time excuse me dances’ (whatever they are), and speeches from the ‘General Election 1929’. But it’s the ‘[Title unidentified]’ material which is most intriguing. 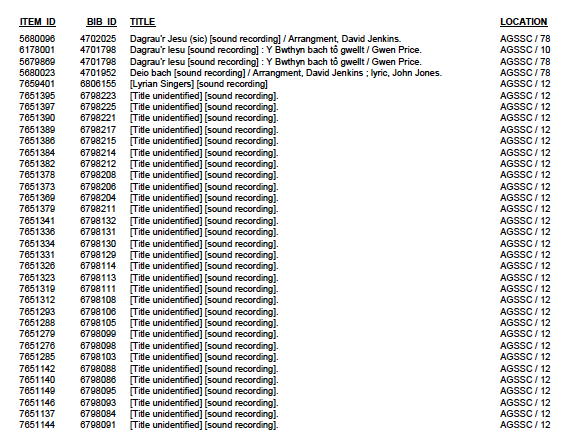 What, I wonder, if anything, do these recordings have in common? How does a recording get anonymised? 11.00 am. Having reviewed the listing, I got back to the book profile. One way of imposing a shape on a body of research material is to cast it in the form of a module proposal. (Would there be a significant take up for a module on sound and spirit?) Throughout the morning, I joined in a volley of emails related to the cover for the coming show’s catalogue. Determining the encapsulating image is not easy. 2.00 pm. The annual exhibition meeting, convened by Mr Garratt. In another life, he’d be a military strategist. The sense of forward momentum is now tangible. An end is in sight. 3.30 pm. Homebase: book work. I begin to draft the description, rationale, and aims of the project. This is the first major hump of any large writing project. The difficulty is that one has to conceive and articulate the whole before one has even begun to write the first sentence. When stuck … read. There is no better lubricant for thought than engaging the mind of another.